This cycle route passes relict dike settlements and interwar garden-city housing, and continues through reclaimed marshes to the heritage-tourism island of Marken, returning along the mediaeval sea dike. The return route is difficult with south, south-west or west winds. 48 km, 5 hours. Revised March 2019.
start at the ferry landing behind Centraal Station (Route 8 also starts here). The quayside was widened by 40 m, to make room for a new bus station and a road tunnel. cross the IJ, by ferry to Buiksloterweg. There are two or three boats on this route. The IJ estuary was once wider, but land was reclaimed on both sides. Centraal Station was built in 1889 on an artificial island, between the old city and the estuary. A ferry was for centuries the only connection to the other side. It is now called Amsterdam-Noord, northern Amsterdam, but until about 1900 it was farmland, and not considered part of the city. After many plans for a bridge, a road tunnel opened in 1968 (IJ-tunnel). Amsterdam-Noord has 97 000 inhabitants. on the other side, cycle away from the ferry, along the entrance basin of the Noordhollands Kanaal (1824). Shipping waits here, to enter the locks ahead. The canal was one of several attempts to by-pass the shallows to the east of Amsterdam. Curiously, the leading maritime city of early-modern Europe had one of the least accessible harbours. Solutions included the Nieuwe Vaart canal in the east of the city, a never-completed canal through the island of Marken (later in this route) , and extra floats under ships. The Noordhollands Kanaal allowed ships to be drawn by teams of horses to Den Helder, on the open North Sea coast. The North Sea Canal, cut straight through the dunes in 1876, finally guaranteed port access. go straight on to the locks, past the weatherboarded 1920’s house with pyramidal roof. Cross the locks, using the footbridge across the lock-gates. go around an open space, immediately after the locks. This was a construction site for the North-South metro line, and as it is redeveloped, the path may be re-routed. go on along the cycle path. At the end of the path, the ventilation towers of the IJ-tunnel are on your left, and ahead is a basketball court. Go left, along the road here, the curving Meeuwen laan. 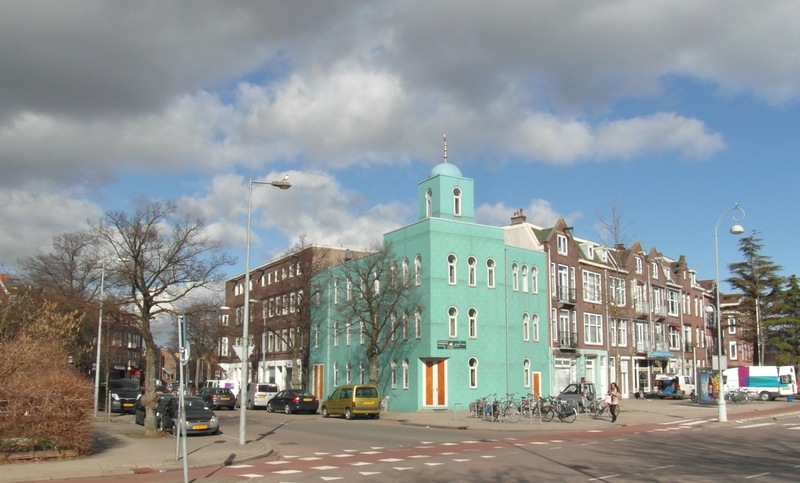 turn second left, at the green-tiled mosque (Valken weg, sign missing). Continue straight on, past local shops, into the Sperwer laan. at the end, cross the road, and then go straight on, along the Adelaars weg, alongside the motorway. (Don’t cross the motorway). Adelaars weg is the line of the former steam tram, north to Purmerend and other small towns (finally closed in the 1950’s). The low-density housing was built in the 1920’s. This area is only 2 km from the city centre: with the metro now open, gentrification has started. The metro line runs in the central reservation of the motorway. at house number 77, turn left, and continue on the separate cycle path, parallel to the street. Pass metro station Noorderpark, go under a road bridge, and cycle on into a park. when you reach the first cycle bridge, turn right, through the park. As you exit the park, turn left along the cycle path, and then right at the zebra crossing. 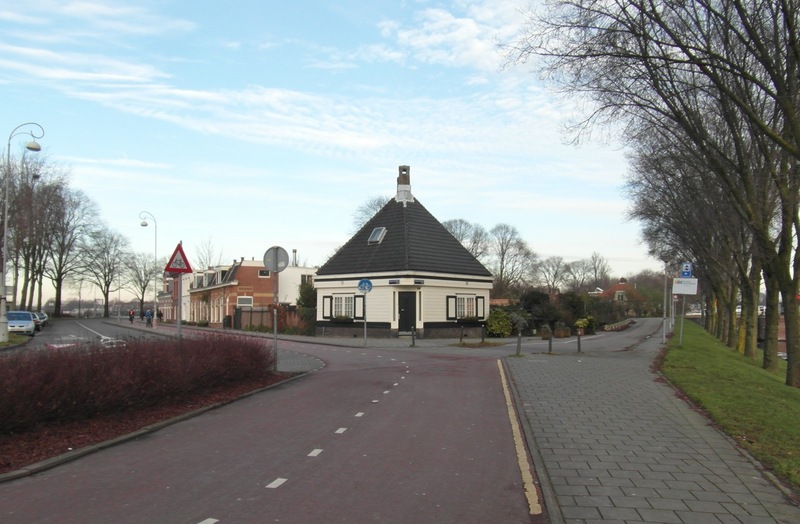 from the zebra crossing, turn into Nieuwendammer dijk – follow the cycle signs for Zunderdorp / Schellingwoude. cycle along Nieuwendammer dijk, at first past 19th-century and 20th-century houses. They are built on the mediaeval sea dike. The oldest houses are further on, in the dike village of Nieuwendam. Nieuwendam is one of the four mediaeval settlements along the dike, along with Buiksloot, Schellingwoude and Durgerdam. You can see it is a dike, because the alleyways between the houses slope down from the road. Many are typical dike houses – apparently single-storey when seen from the road, but with another level below. The sea was on the right-hand side, at least until the 1870’s, when much of the IJ estuary was reclaimed. continue toward the village core of Nieuwendam. Pass the first church, a Catholic church dating from 1889. It is typical in Dutch villages, that the oldest churches are Protestant. After the Reformation, the Protestants got all the existing churches, and Catholic churches were forbidden. The emancipation of Catholics in the 19th century led to a wave of Catholic church building, that continued into the 1920’s. pass Café ‘t Sluisje, and go over the lock (sluice) which gives the café its name. 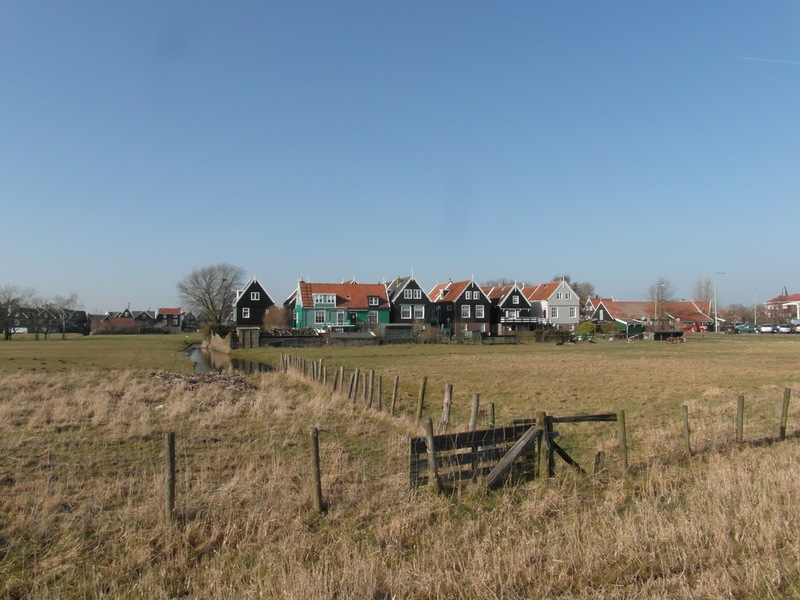 It is the reason for the existence of a settlement here: Nieuwendam was originally a fishing village around a small harbour, with access to the canals of the polders behind the dike. between nr. 333 and nr. 335, turn left into Kerkepad, a narrow street. It is easy to miss this alley, and house numbers are often missing or illegible. Kerkepad means ‘church path’. This too is a typical feature of a dike village – a path starting on the dike, and leading inland to the church. The church (protestant) is surrounded by newer infill. pass the church: the small graveyard is raised above ground-water level. After this point, the remnants of mediaeval settlement end abruptly. Everything else has been added since the First World War. turn right, along the cycle path of the Purmer weg. This area was built in the 1920’s, influenced by the Garden City Movement. About 200 m on, you pass its centrepiece, the roughly hexagonal Purmer plein. 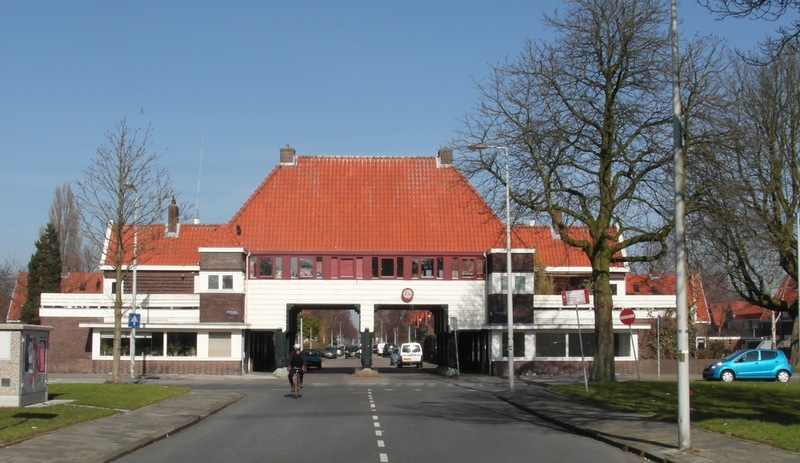 continue along Purmer weg, passing streets with weatherboarded entrance portals. Although it counts as architectural heritage, the area is not gentrified as yet. the road makes a 45-degree turn, into the Volendammer weg: follow the sign for Monnickendam. There is a small open space here, with a monument for the war years. The Commemoration of the Dead at these monuments, on the evening of 4 May, is symbolic of national unity. This 1950’s sentiment is increasingly irrelevant, three generations after the war. 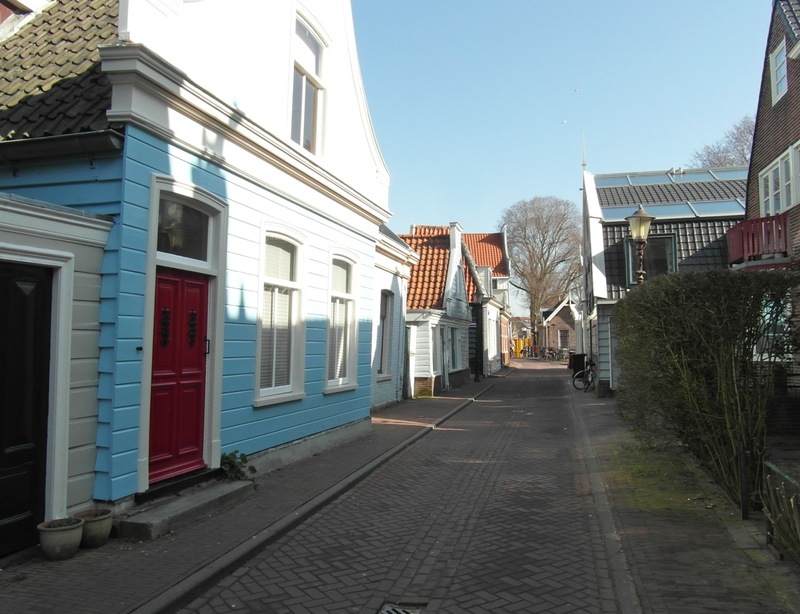 The neighbourhood also seems symbolic of a vanished social vision: a land of white Dutch working families, in neat houses with neat gardens, divided by religion, but with a strong sense of national and social identity, and a common past. continue along the Volendammer weg. The inter-war built-up area ends here. After the 1920’s expansion, came came the worldwide depression, the Second World War, and post-war austerity. There is a park with a lake – and beyond it is where the city started to expand again. Here in Nieuwendam-Noord, urban expansion did not restart until the 1960’s. If there are many people on the street, you can see that this is a typical immigrant housing area. (The older low-rise housing remains ‘white’). cross the IJdoorn laan, and continue along the Volendammer weg. The older housing is being demolished block by block – not because it is derelict, but because it is cheap. Replacing low-rent housing replaces low-income tenants by higher-income owners. For neoliberal urban theorists, that is an unquestioned advantage. pass under the ring motorway. At the council depot, go left onto the cycle path (cycle sign for Doorgaand verkeer). 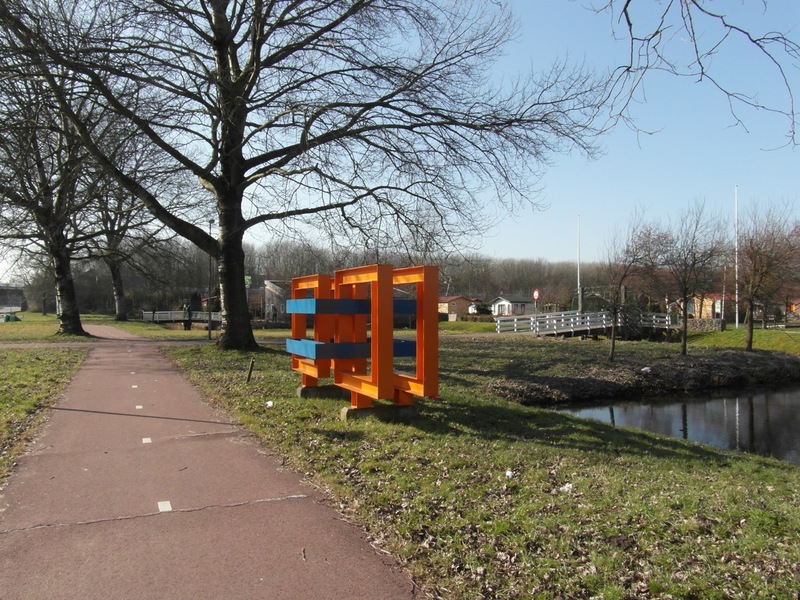 Continue past the orange/blue sculpture, to the white wooden cycle bridge. as you cycle onto the bridge, the city ends. The ring motorway is the boundary of the built-up area, as planned in the 1920’s. This is probably one of the sharpest urban edges in western Europe. cycle straight on, into the open polder landscape of Waterland. Pass under the Amsterdam ring power line, into a preserved mediaeval settlement landscape – church towers mark the small villages. This is classic Netherlands grassland landscape. Until the middle ages, most of the province of Holland was uninhabited peat bog. Reclamation converted it into a dense population concentration, of European significance. The peat here was originally above sea level. It shrank when ploughing exposed it to air, and a sea dike was then necessary (around 1300). Since then, the region has been grassland. The grazing cattle, an icon of Holland for three centuries, are gradually disappearing from the fields. They are usually kept in sheds, and the grass is cut as fodder. at the next road, turn left, follow the cycle sign for Zunderdorp. Use the cycle path. You may have to wait for crossing cows. after 500 m, at the cluster of sheds, turn right onto a new footpath / cycle path, over a cattle grid (veerooster). cross a small bridge (the right-hand bridge), and cycle on through the fields. About 1 km on, the path rises a few metres, enough to give an excellent view of the open flat landscape. stop at the metal/concrete information panel for Volgermeerpolder, just beside the cycle path. This is the largest toxic waste dump in the Netherlands. The area was first used as a domestic waste landfill, by the city of Amsterdam. Tens of thousands of barrels of pesticide residue were illegally dumped, from the 1950’s onward: it became one of the great Dutch environmental scandals. The landfill closed in 1981: the present solution is the result of years of research, and took six years to implement. The waste is still there under your feet, covered by multiple protective layers, which are intended to form a natural seal. cycle on toward the village visible ahead. The village of Broek in Waterland has been a tourist destination since the 17th century, originally for is prosperity, neatness, and cleanliness, and now for its historic wooden houses, painted in a distinct local colour (platinum grey). New houses in the village are sometimes built in the same style. after 500 m, turn right, at the cycle sign for Monnickendam. This looks like a side street, but the street name is still Wagengouw. cross the narrow cycle bridge. Just after the bridge, turn right, follow the cycle sign for Zuiderwoude. go straight on (cycle sign ‘Doorgaand Verkeer’), and out of the village. After the last houses, use the cycle path on the right, because the road is dangerously narrow. cycle 2 km on, to the small village of Zuiderwoude. You can stop to rest in front of the church, on park benches facing the lake. A sign explains the history of the area: the lakes are the result of early-mediaeval flooding. The village looks idyllic: but remember that without intensive planning control, a sea of suburban houses would have reached it by now. You are 11 km from the Amsterdam Stock Exchange. pass the church, and cycle on into Zuiderwouder Dorpsstraat. Follow the sign for Dorpshuis, but check the street name sign, on your right just after the first house. cycle on to the end of the village, and follow the road as it bends left (cycle sign for Marken). You now cycle toward the sea dike: the town of Monnickendam is visible left. at the end of the road, go up the steps, to the cycle path on the dike. Turn right, toward Marken. You are again on the mediaeval sea dike of North Holland and West-Friesland. Beside the steps is a green cast-iron pillar with the number 26: this is one of the dike marker posts, at 1 km intervals. Ahead, to the right, is the island of Marken. This is the shore of the Gouwzee, an arm of the Zuiderzee. The dike lost its primary function when the Afsluitdijk (enclosure dike) was completed at 13.02 on 28 May 1932. Marken was, until the late 19th century, a very poor fishers island, inaccessible during winter storms. It was cut off from the rest of Holland by a flood in 1164 – in the early Middle Ages much land was lost in the region. The sea broke through into the fresh-water lake Almere, forming the Zuiderzee (Zuyder Zee in the old spelling). 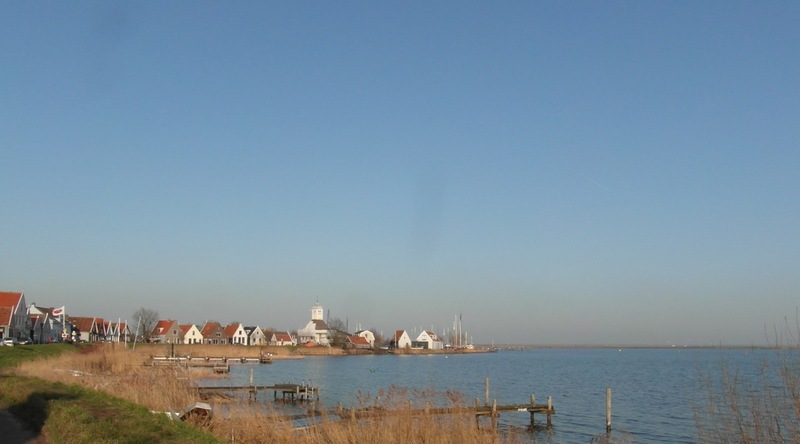 Marken continued to shrink by flood erosion, until the 1932 enclosure dike reversed the effects of the mediaeval breakthrough – converting the Zuiderzee back into a freshwater lake. In 1957 a dike joined Marken to the mainland – completing its transformation into a heritage tourism destination. pass the junction of the 1957 dike with the old sea dike: go straight on. 800 m further, at the wind turbines, the dike turns north. The former sea coast is visible, from Amsterdam to the wooded ridge of the Gooi (with the Hilversum TV tower, about 22 km away). The nearer buildings are the centre of the planned city Almere in the Flevo polder (reclaimed 1968). To the north-east, on clear days, you can see the telecom tower of Lelystad, another planned city in the polder. cycle along the dike, built as part of the plans for a Markerwaard polder. Reclamation of Markerwaard was abandoned – due to environmental concerns, and also the growing water-sport lobby. as you approach Marken, the settlement pattern is visible: raised clusters of houses. At the ring dike of the island, the road dips into the low-lying land: the island is itself a polder (263 hectares). the parking area marks the start of tourist Marken: cycle left around it, to the wooden bridge, Beatrix-brug. (If you want to buy some food, the island’s only supermarket, Deen, is opposite the car park). cross the wooden bridge and cycle into the village. At first there is only one street, then follow the signs for ‘Haven’ (harbour in Dutch). At the harbour, some old houses have been preserved: now bars, restaurants, or souvenir shops for heritage tourism. at the harbour, turn right and then next right, away from the harbour. The numbers in circles on signs are the junctions of a cycle route network: go toward junction 52.
pass through a newer section of the village, cross the Juliana bridge, and turn left to Kerkbuurt (church quarter). 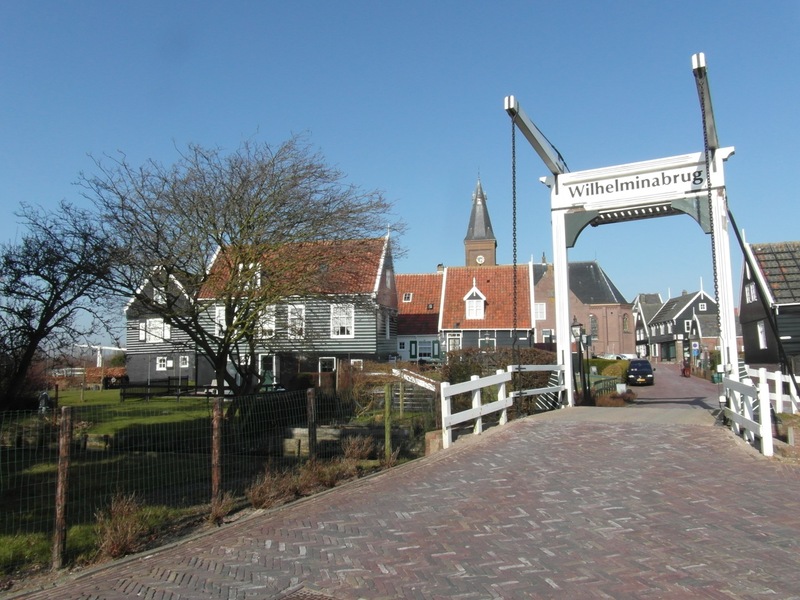 Follow the signs for ‘Grote Kerk’ / junction 52, and then cross the Wilhelmina bridge. Kerkbuurt is the oldest settlement on Marken, founded by monks from the monastery Mariëngaarde in Friesland, around 1235. The monks organised the construction of dikes to protect the island, and built a monastery here, on artificially raised ground. In later centuries more of these artificial mounds were added, about 1,5 m above sea level: they are called a ‘terp’ in Friesland. The largest cluster of houses is around the harbour (Haven), the others are: Kets, Wittewerf, Grotewerf, Rozenwerf, Moeniswerf, and Kerkbuurt. At the terp edges and near the harbour, some houses are built on piles. The island terp cluster on Marken, and the local architecture, are unique in Europe. pass the church and the small museum, and follow the street out of Kerkbuurt, into open land. at the bus stop (bus 315 to Amsterdam), turn right, toward junction 52. Use the cycle path (left of the road at first). cycle back towards the main car-park: further on, the island’s lighthouse is visible (left). Also on the left are the other clusters of houses: they give a better impression of the original settlement structure. pass the car park, and cycle away from the village, back toward the dike. Beside the road (right) is a remnant of an exit canal from Amsterdam, dug to avoid the Pampus shallows. It was cut in 1825, left unfinished, and later much of it silted up. Its curved line is still clearly visible from the air. It may seem strange to cut a canal through an island, when you can sail around it already – but with the technology of the time, that was the best option to avoid the shallows. pass the wind turbines, continue to the road junction, and turn left, following the sign for Durgerdam. Use the cycle path (left of the road). you now follow the old Waterland sea dike, back to Amsterdam. Cycle first at the foot of the dike, passing a new holiday marina development. after this development, pass the yacht harbour of Uitdam. The cycle path now continues on the curving dike. at the small village of Uitdam, the cycle path drops back down to the road. This is a farming village rather than a fishing village, oriented to the polder, the landward side. After the village, the path climbs back up to the dike. pass another cast-iron marker for the 30 km point, with the inscription Noorder IJ en zee dijk. On the land side are lakes, some created when the dike broke in the past. Some were reclaimed again, as a polder within the polder, such as Blijkmeer polder alongside post 33. Note the small ring canal around this former lake. pass Kinsel meer, the largest of the lakes. Ahead on the seaward side of the dike is the IJdoorn promontory. A new marshy lagoon – “new nature” – was created here, by building a breakwater parallel to the dike. Beside the iron lighthouse tower at the point, is a fortified battery of the 19th century defence line Stelling van Amsterdam. This battery guarded the entrance to the IJ estuary. the cycle path ends, go on into the village of Durgerdam. This is a harbour village, oriented to the seaward side: it still is a yacht harbour. at the small weatherboarded church (1687), the dike makes a right-angle turn. The new arch bridges to Amsterdam’s newest suburb, IJburg, are visible to the south. 100 m before the ring power line, turn right onto the cycle path in the fields, toward junction 46.
about 1 km further, pass under the ring motorway, and then under the viaduct of the arched Schellingwoude bridge. Follow the cycle signs for Centrum. continue into the next dike village, Schellingwoude. The road is on the dike, the houses are all on the landward side, and there is still some open water, with moored boats. This dike settlement has retained its basic structure – but everything else you can see, is a 19th-century or 20th-century addition. continue along the Schellingwouder dijk. After nr 83, the original dike is cut by a never-completed road project. Go onto the cycle path, then follow the sign for Centrum. Be careful crossing the road here! at the end of the cycle path, go straight on: follow the sign for Centrum. At first this appears to be a dead-end road, but it turns right to rejoin the old dike road. You are now back in Nieuwendam. cycle into the village core: you are now back on the outward route. Cross once again the lock at Cafe ‘t Sluisje, and cycle on along Nieuwendammer dijk. at the end of Nieuwendammer dijk, go about 20 m to the left, and cross the road, at the cycle crossing. Then turn left, along the main road, Meeuwen laan. pass a roundabout, go straight on. 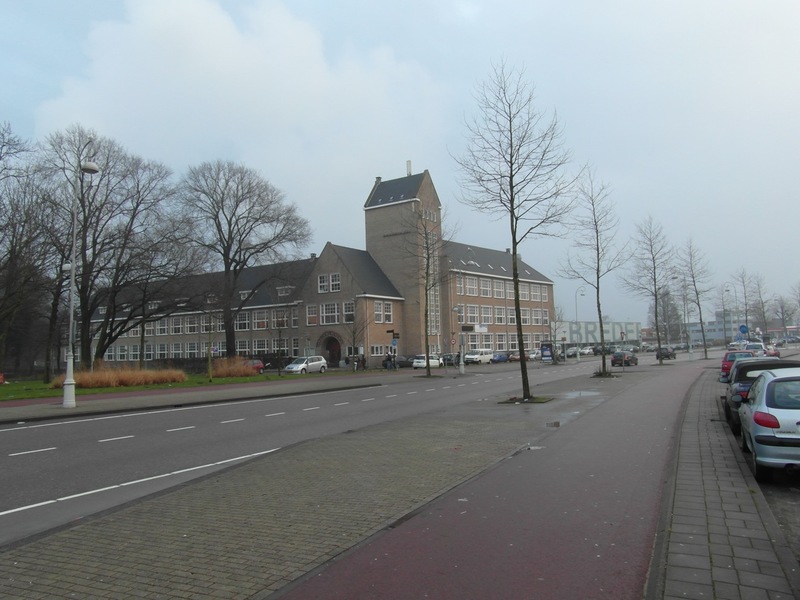 just after you pass the Dirk van den Broek supermarket, at the corner of Haviks laan, turn left across the road. go under the block on pillars: the street name is Motor wal. cycle along Motor wal, a former dock basin. At the end, the whole of the eastern docklands are visible, from the mouth of the Amsterdam-Rhine Canal to Centraal Station. Again, almost all of this was reclaimed in the 19th century. turn right along Noord wal. At the end of Noord wal, use an unnamed footpath along the water’s edge: it brings you to the IJplein ferry. cross by the ferry (every 15 minutes off-peak, every 7 minutes peak times), to the landing stage behind Centraal Station, the end point of this route. This entry was posted in Cycle routes and tagged Amsterdam, bike, Holland, Marken, Zuiderwoude. Bookmark the permalink. Wow this is so cool! I never knew this existed, I will have to give a try next time I am there.